Say goodbye to dropped chains and limited gearing choices! Brood thinks it's about time that kids get some nice stuff too! What have we learned over the years? 2) There are not enough gearing choices for little legs and steep terrain when using traditional 4 arm cranks. These are the reasons that we made the Brood Styx cranks with direct mount, narrow wide chainwheels. No more limit of 30-32 teeth and a huge reduction in dropped chains. 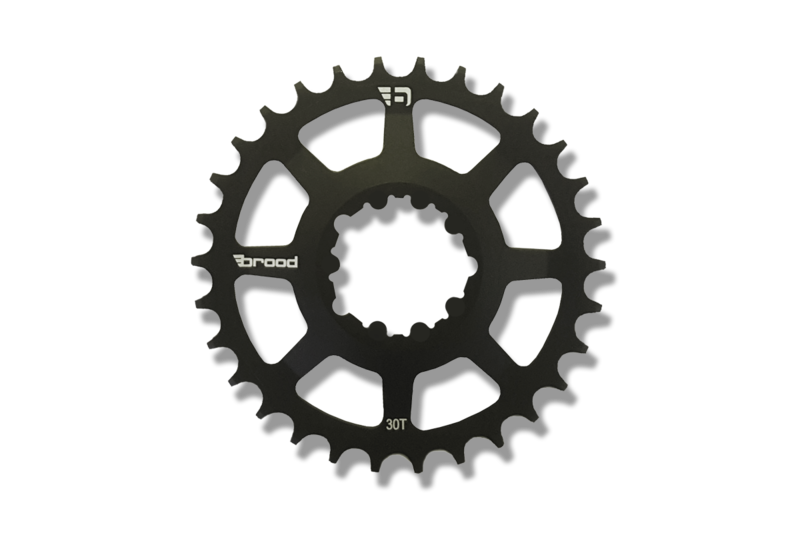 Now we're offering these chainwheels separately so that people can change out the chainwheels on their Brood Styx crank or any other crank that uses the SRAM direct mount pattern and GXP spacing (6mm offset). So mom and dad can get a chainwheel that looks and performs amazing for their bikes as well! CNC'd out of 6061 alloy and available in 26t, 28t, 30t, 32t and 34t options.